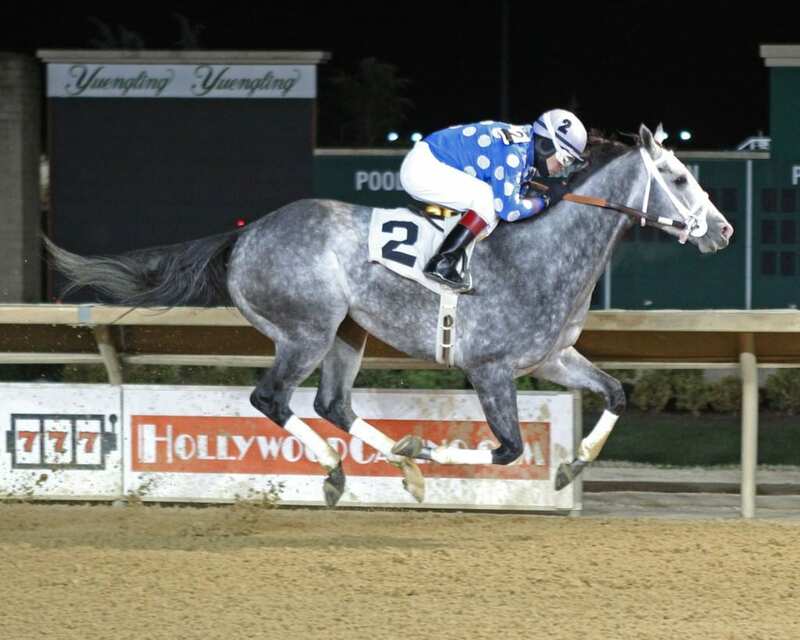 Runnin’toluvya won the A Huevo Stakes at Charles Town Races. Photo by Coady Photography. Saturday’s $50,000 A Huevo Stakes at Hollywood Casino at Charles Town Races figured to be something of a replay of last month’s $300,000 West Virginia Breeders Classic. After all, the distance — 1 1/8 miles — was the same. And many of the players in the contest for state-breds were the same; the top four from last month’s test all returned for this one. Yet no one could have foreseen that it would turn out to be such an exact replay. That, however, is what it turned out to be. With Oscar Flores in the irons, favored Runnin’toluvya zipped to the early advantage, doled out controlled fractions, and held the hard-trying second favorite, North Atlantic, safe to win by two lengths — the margin almost exactly the same as it had been in the Classic. In fact, the top four finishers from the Classic also ran one-through-four in the A Huevo. The win marked a fitting likely conclusion to Runnin’toluvya’s 2018 season. The Tim Grams trainee has won eight of nine starts this season — the lone blemish a runner-up effort an allowance contest that was his second start of the year. This also was his third consecutive stakes victory, the first of which was a score in the Frank Gall Memorial on Charles Town Oaks night. Runnin’toluvya, a four-year-old son of Fiber Sonde, has earned $276,730 to date in 2018. All told, the horse, who is owned by Grams and his wife Judy, has won 10 of 14 career starts with more than $329,000 in the bank. Trainer Jeff Runco had entered the contest hoping that one of his duo — North Atlantic, second in the Breeders Classic, or Weekend Liberty, third in that test — could turn the tables on Runnin’toluvya. The former had run willingly despite breaking from the far outside — a near-death knell going three turns at CT — while the latter was no threat to the top pair though well clear of the rest. But being drawn better, in the four hole, and facing a more compact field of six, versus the 10 who ran last month, could not change the outcome last night for North Atlantic. He chased the winner doggedly from second but could make no real impact; the margin at every point of call was two lengths. He ended up three lengths-and-change ahead of his stablemate, Weekend Liberty, who in turn was eight clear of the rest — the rest led, as they were in the Classic, by Awsome Faith. There are two stakes races left on the 2018 calendar at Charles Town: the $50,000 My Sister Pearl for older state-bred fillies and mares going 1 1/8 miles on November 17 and the $50,000 Eleanor Casey Memorial for state-bred two-year-old fillies going seven furlongs on December 1.